Elder Joseph Weyel is a Pastor and Minister of the Gospel. He is originally from San Antonio, Texas, USA where he has lived until May of 2009. 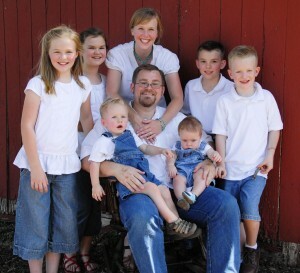 Joseph and Rachel were married in 1999 and have been blessed with six children born in 2000, 2001, 2002, 2005, 2010, and 2012 respectively. A second generation home educating family, each of the children is pursuing a customized course of study based upon primary source materials and traditional educational resources. Joseph began serving as pastor of Luling Primitive Baptist Church in January of 2007 during which time the Lord opened the door of ministry to Vietnam, and later to Cambodia. Elder Weyel is has also been employed as a design consultant/project manager, and estimator for CDI Technology Services (a San Antonio based Information Transport Services and Electrical contractor) since 1998. In January 2009, Joseph and Rachel committed to relocate their family to Siem Reap, Cambodia in an effort to assist in the ministry of the Word among the native Khmer Christians and to coordinate the supply of materials and finances for orphanages and humanitarian projects around Siem Reap and Kampong Thom provinces. Returning to San Antonio, in the Summer of 2010, the Weyel’s continue to pray for their friends in Cambodia and look forward to every opportunity to return to the work there. They are actively engaged in local outreach ministries in San Antonio and Seguin, Texas and are seeking daily guidance and direction as they seek to serve the Lord and his people.